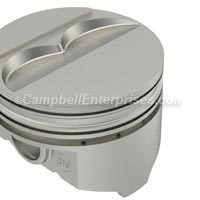 High performance KB Chrysler 450 stroker pistons offer a significant performance improvement for your engine, at a very affordable price. 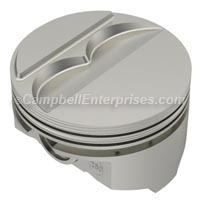 We have these piston sets available in a wide range of sizes including standard bore and many popular oversizes. 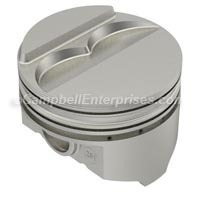 If you are building a Chrysler, Plymouth, Mopar, Dodge 400 engine into a stroker by using a 440 3.750 stroke crank and are looking for improved performance, without the higher cost of forged pistons, KB performance pistons are an excellent alternative for many street, muscle car restoration, cruising and street / strip applications. Centered pin. Suggest checking quench dome with clay for clearance. .095 tall quench pad. Closed chamber heads require the quench dome to be machined down. Made from Chrysler 400 block. Use stock or Eagle H beam 6.358 long rods. Comp. ratio will change with quench dome machining. Centered pin. Suggest checking quench dome with clay for clearance. .260 tall quench pad. Closed chamber heads require the quench dome to be machined down. Made from Chrysler 400 block. 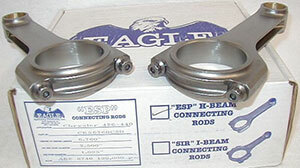 Use stock or Eagle H beam 6.358 long rods. Comp. ratio will change with quench dome machining. .150" quench dome, centered pin. Suggest checking quench dome with clay for clearance. Engine cannot be assembled without machining quench dome. Made from Chrysler 400 black. Use stock or aftermarket 440 length rods of 6.760 inches.